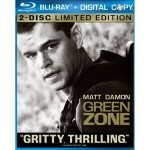 Universal Studios will release Green Zone as a 2-disc Blu-ray set on June 29 [UPDATE: Green Zone will release a week earlier on June 22, 2010], which for a limited time includes a digital copy of the film. Green Zone will also be made available as a digital download through services like iTunes and the PS3 store. And, of course the film will be available on-demand through cable and satellite providers. Green Zone stars Matt Damon as Chief Warrant Officer Roy Miller who finds many of his leads toward discovering weapons of mass destruction in Baghdad are turning up dry. He soon discovers a tangled web of politics between the CIA, the U.S. Military, and the crumbling Iraqi government. The Blu-ray Disc will be formatted in 1080p at 2.40:1 aspect ratio. Audio will be DTS-HD Master Audio 5.1 surround sound. Bonus features on the Blu-ray (and DVD) include deleted scenes, commentaries, and making-of featurettes. The Blu-ray Disc will contain additional features utilizing BD-Live, pocket BLU, and “social BLU” for connectivity with social networks. See below for full features. — Matt Damon demonstrates the grueling training regimen he used to prepare for his role in Green Zone. — Inside the Green Zone–An exclusive behind-the-scenes look at the making of some of Green Zone’s most powerful scenes. — Feature Commentary with Matt Damon and Director Paul Greengrass. — Digital Copy: Transfer Green Zone to your iPod®, Mac® or PC and experience it anywhere, anytime! — Advanced Remote Control: A sleek, elegant new way to operate your Blu-ray player. Users can navigate through menus, playback and BD-Live functions with ease. — Video Timeline: Users can easily bring up the video timeline, allowing them to instantly access any point in the movie. — Mobile-To-Go: Users can unlock a selection of bonus content with their Blu-ray discs to save to their device or to stream from anywhere there’s a Wi-Fi network, enabling them to enjoy exclusive content on the go, anytime, anywhere. — Browse Titles: Users will have access to a complete list of pocket BLU app-enabled titles available and coming to Blu-ray Hi-Def. They can view free previews and see what additional content is available to unlock on their device. — Keyboard: Enter data into a Blu-ray player with your device’s easy and intuitive keyboard that will facilitate such as Blu-ray features as chatting with friends and sending messages. — social Blu: Connect with Friends on your favorite social networks to share information about the movie, enjoy Blu-ray community features and more! — U-Control: Universal’s exclusive feature that lets the viewer access bonus materials without leaving the movie! — Picture In Picture – Get behind the scenes features and interviews with the cast and crew while you watch the movie! Previous Previous post: Does your DVR quit before a game ends?